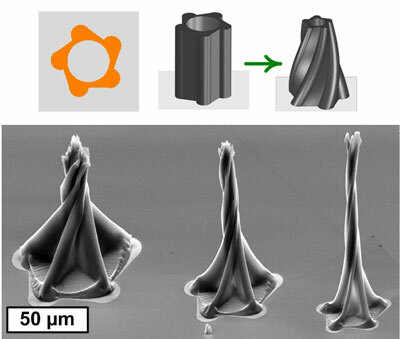 (Nanowerk News) Twisting spires, concentric rings, and gracefully bending petals are a few of the new three-dimensional shapes that University of Michigan engineers can make from carbon nanotubes using a new manufacturing process. The process is called "capillary forming," and it takes advantage of capillary action, the phenomenon at work when liquids seem to defy gravity and travel up a drinking straw of their own accord. The new miniature shapes, which are difficult if not impossible to build using any material, have the potential to harness the exceptional mechanical, thermal, electrical, and chemical properties of carbon nanotubes in a scalable fashion, said A. John Hart, an assistant professor in the Department of Mechanical Engineering and in the School of Art & Design. Twisting spires are one of the 3D shapes researchers at the University of Michigan were able to develop using a new manufacturing process. They could lead to probes that can interface with individual cells and tissues, novel microfluidic devices, and new materials with a custom patchwork of surface textures and properties. A paper on the research is published in the October edition of Advanced Materials, and is featured on the cover. "It's easy to make carbon nanotubes straight and vertical like buildings," Hart said. "It hasn't been possible to make them into more complex shapes. Assembling nanostructures into three-dimensional shapes is one of the major goals of nanotechnology. The method of capillary forming could be applied to many types of nanotubes and nanowires, and its scalability is very attractive for manufacturing." Hart's method starts by stamping patterns on a silicon wafer. His ink in this case is the iron catalyst that facilitates the vertical growth of the carbon nanotubes in the patterned shapes. Rather than stamp a traditional, uniform grid of circles, Hart stamp hollow circles, half circles and circles with smaller ones cut from their centers. The shapes are arranged in different orientations and groupings. One such grouping is a pentagon of half circles with their flat sides facing outward. He uses the traditional "chemical vapor deposition" process to grow the nanotubes in the prescribed patterns. Then he suspends the silicon wafer with its nanotube forest over a beaker of a boiling solvent, such as acetone. He lets the acetone condense on the nanotubes, and then lets the acetone evaporate. As the liquid condenses, capillary action forces kick in and transform the vertical nanotubes into the intricate three-dimensional structures. For example, tall half-cylinders of nanotubes bend backwards to form a shape resembling a three-dimensional flower. By using unique two-dimensional templates, researchers at the University of Michigan could coax carbon nanotubes to grow in intricate, curving three-dimensional structures. "We program the formation of 3D shapes with these 2D patterns," Hart said. "We've discovered that the starting shape influences how the capillary forces change the structures' geometry. Some bend, others twist, and we can combine them any way we want." The capillary forming process allows the researchers to create large batches of 3D microstructures?all much smaller than a cubic millimeter?over essentially limitless areas, Hart said. In addition, the researchers show that their 3D structures are up to 10 times stiffer than typical polymers used in microfabrication. Thus, they can be used as molds for manufacturing of the same 3D shapes in other materials. "We'd like to think this opens up the idea of creating custom nanostructured surfaces and materials with locally varying geometries and properties, " Hart said. "Now, we think of materials as having the same properties everywhere, but with this new technique we can dream of designing the structure and properties of a material together." 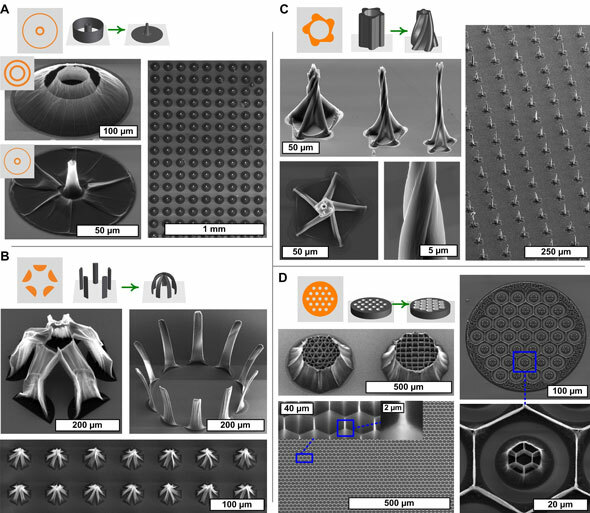 The paper is called "Diverse 3D Microarchitectures Made by Capillary Forming of Carbon Nanotubes." This research is funded by the University of Michigan College of Engineering and the U-M Department of Mechanical Engineering, the Belgium Fund for Scientific Research, and the National Science Foundation.